The Wasdale Head Inn in Cumbria has launched a campaign to trace the owner after a ‘very honest person’ handed in the camera. 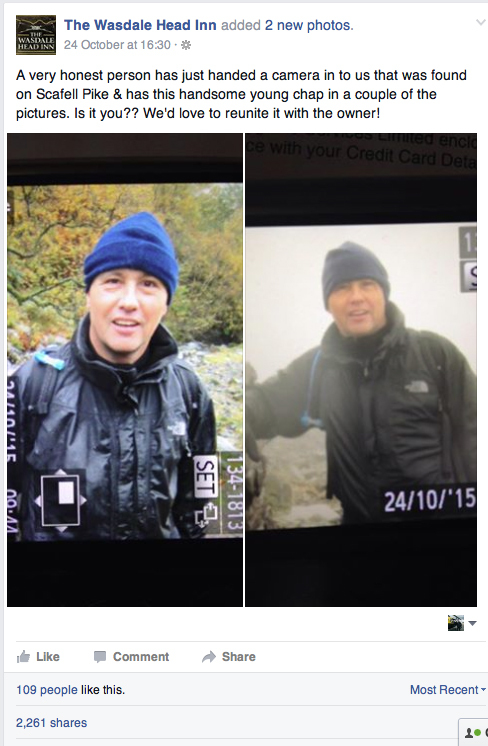 The pub tweeted that the camera was found on Scafell Pike and posted a photo of a man it retrieved from the device. The Wasdale Head Inn then posted a message on Facebook, which reached more than 121,000 people after it was shared more than 2,200 times. Can you help? For full details of the appeal, visit The Wasdale Head Inn Facebook page.